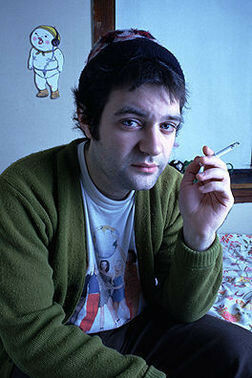 Jim O'Rourke (born January 18, 1969) is an American musician and producer. He was long associated with the Chicago experimental and improv scene. Around 2000 he relocated to New York City and currently resides in Tokyo. He has released albums of jazz, noise and guitar rock music. O'Rourke has collaborated with the likes of Thurston Moore, Derek Bailey, Mats Gustafsson, Mayo Thompson, Loren Mazzacane Connors, Merzbow, Nurse With Wound, Phill Niblock, Fennesz, Organum, Henry Kaiser, Flying Saucer Attack, and most recently mixed Joanna Newsom's album Ys. He has produced albums by artists as varied as Sonic Youth, Wilco, Stereolab, Saint Etienne, Kahimi Karie, Quruli, John Fahey, Smog, Faust, Tony Conrad, The Red Krayola, Bobby Conn, Beth Orton, Joanna Newsom and U.S. Maple. He mixed Wilco's very successful Yankee Hotel Foxtrot album, which made many reviewers' top ten lists for 2002, and produced their 2004 album, A Ghost Is Born, for which he won a Grammy for "Best Alternative Album". During the recording of Yankee Hotel Foxtrot, O'Rourke collaborated with Wilco member Jeff Tweedy and pre-Wilco Glenn Kotche, a veteran of the Chicago scene and O'Rourke's own solo albums, under the name Loose Fur. Their self-titled debut was released in 2003 with a follow-up in 2006 entitled Born Again in the USA. He also mixed the unfinished recordings that made up a planned third album by the late American singer-songwriter Judee Sill, recorded in 1974 and mixed by O'Rourke for a 2005 release. O'Rourke has released a large number of albums and was once a member of Illusion of Safety, Gastr Del Sol and Sonic Youth. From 2000 he played bass guitar, guitar and synthesizer with Sonic Youth, in addition to recording and mixing duties with the group. He withdrew as a full member in late 2005 to pursue his interest in filmmaking, but continues to play with them in some of their side projects. With music director Takehisa Kosugi, he played for the Merce Cunningham dance company for 4 years. In 2001 he was awarded a grant from the Foundation for Contemporary Arts Grants to Artists Award. * He worked as a music consultant for the popular 2003 film, School of Rock. * He scored the 2002 film Love Liza directed by Todd Louiso. * He has also scored films by Werner Herzog, Olivier Assayas, Shinji Aoyama, Koji Wakamatsu and others. * His own short films have been part of the 2004 and 2006 Whitney Biennial and the 2005 Rotterdam Film Festival. * His three full-length albums for Drag City are named after three successive films by director Nicolas Roeg: Bad Timing: A Sensual Obsession, Eureka, and Insignificance.